For the first time since its inception four years ago this year's St. Sebastian and St. Mardarije Orthodox Institute was hosted by a parish outside the Western American Diocese. 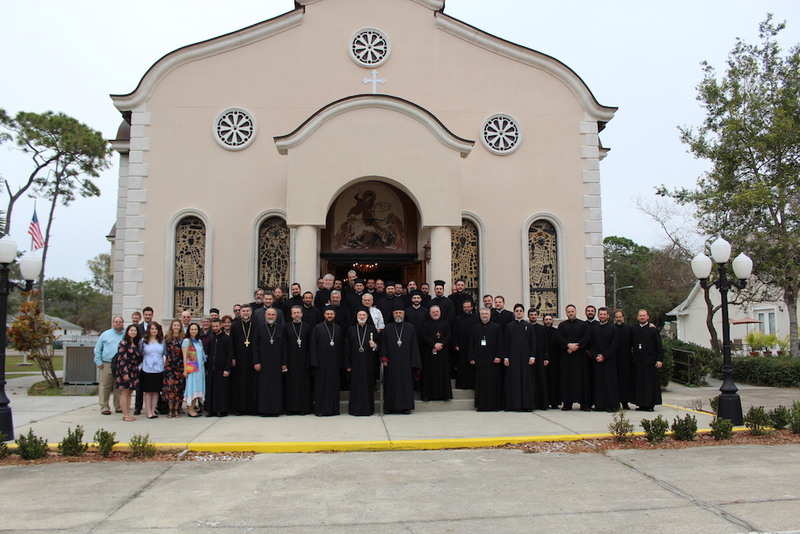 The St. George Serbian Orthodox Church in Clearwater, Florida of the Eastern American Diocese, was host to this year's event. Registration in the late afternoon hours on Tuesday, February 13, 2018, marked the beginning of the event. After Vespers, served by host priest V. Rev. Stavrophor Dragan Zaric, Their Graces Bishop Irinej of Eastern America and Bishop Maxim of Western America greeted all the gathered clergy and participants both in the church and later after dinner in the fellowship hall. Also attending this year's Institute were His Grace Bishop Longin of Midwestern America and His Grace Bishop Kirilo of Dioclea. Registration continued after dinner and the following morning after Matins, as clergy from all dioceses nationwide, including three clergy from the Diocese of Canada, continued to arrive. Following breakfast Bishop Maxim introduced this year's speaker Dr. Gayle Woloschak. Currently a professor of Radiation Oncology at Northwestern University in Chicago Dr. Woloschak is also an adjunct professor of Religion and Science at Lutheran School of Theology in Chicago and at Pittsburgh Theological Seminary. She holds a Ph. D. in Biomedical Sciences from the University of Toledo (Medical College of Ohio), and a D. Min. in Eastern Christian Studies from Pittsburgh Theological Seminary. Throughout the days presentation Dr. Woloschak spoke extensively on the relationship between science and religion and the negative connotations Christians almost instinctively have for science. Part of this is due to a misrepresentation and misunderstanding of science. While overcoming such obstacles requires dialogue, conservative Christians view their faith as ancient and subsequently fear any discussion that might introduce change. However, facts presented by science shape our understanding of diseases. For instance, in the early days of HIV when it was not known how the disease was spread, quarantining patients was an option. Later, when more discoveries were made about how it was spread this option became unethical. In other words, science should be used to help us better understand the world we're living in which, in turn, will help pastors better deal with some of the complex issues parishioners are faced with. St. Basil the Great noted in one place that "....the herbs which are the specifics for each malady do not grow out of the earth spontaneously; it is evidently the will of the Creator that they should be brought forth out of the soil to serve our need....Consequently, we must take great care to employ this medical art, if it should be necessary, not as making it wholly accountable for our state of health or illness, but as redounding to the glory of God and as a parallel to the care given the soul.. “. 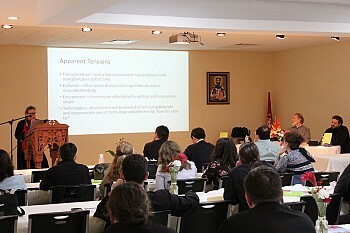 Furthermore, Dr. Woloschak suggested the formation of pastoral teams who are more knowledgeable in various scientific fields to assist the priest in his pastoral work. There are many cases, for instance, of couples who bring babies to be baptized and the priest will only later learn that the baby was born by in vitro fertilization. There is such a divide between science and religion that most people wouldn't think to first consult the priest about something they are convinced he will categorically be opposed to. Another example are the prayers for a mother after a miscarriage which – based on scientific evidence – might result in the Church considering altering the prayers that they be more comforting. Science is technology driven and that technology is rapidly changing. While a diagnosis of cancer in 1940 meant a certain death, today patients have other options to consider. The same applies to a childless couple who 50 years ago had no other option than adoption, today technology offers other solutions. The Orthodox Church needs to have a response to all of these new technologies, and a better understanding of the science behind it. All of this and more supports the argument that there needs to be a dialogue within the Church on all of these topics. Lively discussions were had both during the morning and afternoon talks. In the evening Great Vespers with the Litiya on the eve of the Feast of the Meeting of the Lord was served by V. Rev. Stavrophor Nicholas Ceko, Protosindjel Vasilije (Gavrilovic), V. Rev. Vasilije Vranic and Deacon Jovan Anicic. His Grace Bishop Longin blessed the five loaves. Dinner in hall was followed by fellowship as one by one the clergy left for their hotels in preparation for the next day's feast and Holy Hierarchical Divine Liturgy.